A green salad should never be a boring option. Look for a mixture of textures, add a flavourful dressing, and all of a sudden the sideshow becomes the main event. Heat a small saucepan over medium heat and add half the oil. Add the onion and fry until softened and fragrant, about 5 minutes. Add the anchovies (if using) and fry for a further minute. Remove from the heat and add the remaining oil. Allow to cool for about 5 minutes, then whisk in the mustard, lemon juice, vinegar and honey. Season with salt and add freshly ground black pepper to taste. Set the dressing aside while you prepare the salad. Wash the salad leaves, tear them into bite-sized pieces and refrigerate. 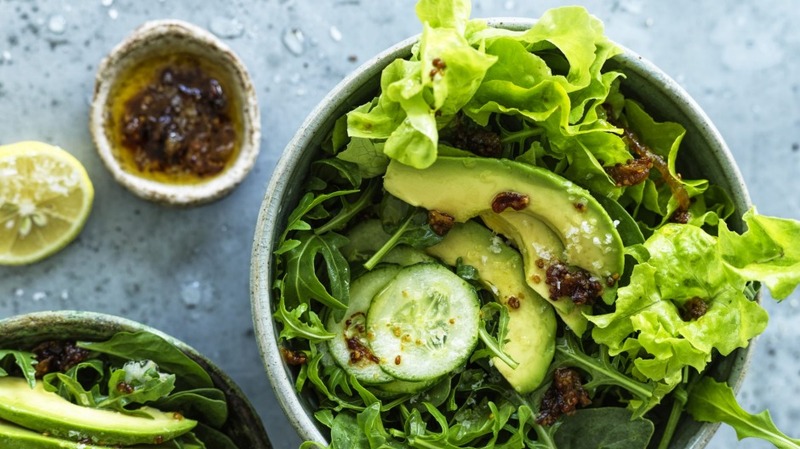 When ready to serve, spin the leaves dry and toss together with the cucumber, avocado and just enough dressing to coat. Adam's tip: Chilling leaves in the fridge for about 30 minutes after they've been washed will give you a lovely crisp salad. Just spin them dry and don't dress your salad until immediately before it hits the table. Try Adam Liaw's whole roasted cauliflower with hummus and honey.